Two decades ago - Don didn't wake up. The day before, he had one of the best days he'd had in months. After weeks and weeks of health crises and now-and-then emergency room visits, he was restored: happy, energetic, and gloating with me over how proud and delighted we were about our kids and our lives. We'd driven home from Madison after Stephen's graduation ceremonies on Saturday: Both Valerie and Stephen were through with college, both were doing brilliantly, and all was well with the world on a sunny May day. We'd driven by fields where sprinklers had been encouraging just-planted crops - and the sprays of water had made rainbows as we traveled. On his way to the house, Don plunged his face into the sprays of lilac blossoms blooming next to the garage, and we basked in the glories of the day and our lives. It had been a wonderful weekend. 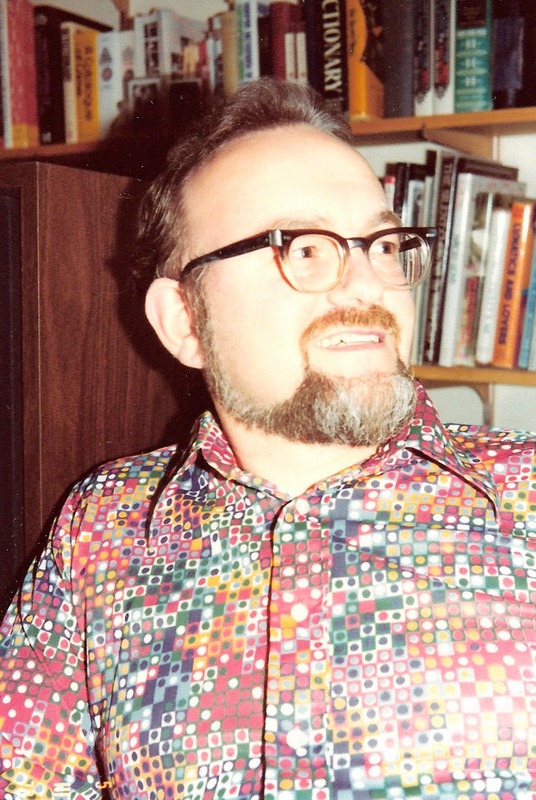 Don died May 23, 1994 - and, thanks to our work together in those pioneering days of comics fandom, many of our friends in that world thought of him solely in those terms. But he was brilliant in too many ways to list here. Even as a college student in the Journ School at Penn State, he was active in student radio (WDFM, where his work included his "Dead Air" show devoted to comedy and his other stint devoted to folk music) and the student science-fiction club. It was his SF fan activity that led to our meeting in 1957 - and we attended Detroit and Pittsburgh WorldCons separately before we were married and then many other SF cons big and small afterward. His "The New Science" in Venture Science Fiction opened the door to his membership in Science Fiction Writers of America, where he served a term as one of its officers. His knowledge was encyclopedic, his reading speed was swift, and, wow, he was fun. Following 1960 graduation from Penn State, his newspaper career lasted for more than two decades at The Cleveland Press (a job he'd chosen to be near to where I was attending Oberlin College), and his assignments included the financial department, police beat, suburbs, and copy desk with byways including writing feature articles and folk music, science-fiction, and fantasy reviews. The Press left Cleveland - and so did we, when our mutual hobby of comics turned into our mutual profession of editing collector publications. We were lucky: We got to work and live together all day every day for more than two decades. We were granted the delights of two fantastic kids - and those kids continue to be a constant joy. Today, we share the pleasures of remembering their dad. We were lucky we had him as long as we did. Love you, Don. Maggie, I regret that I did not get the opportunity to meet or know Don. However, I DO know him through you, and I can only surmise that he was a wonderful, intelligent, and interesting individual. My heart goes out to you on this sad anniversary; so glad you have chosen to focus on some fond memories. God bless! I knew him only through his writing and other work, but reading All in Color for a Dime at an early age helped spark a lifelong love of learning more about older comics and creators. So I owe him a lot. Astonishing to me that it's been 20 years. I was always glad I got to meet you and Don many times in the early 1990s when I was working on Marvel-related games for TSR. I was smiling as I read your piece about Don and now miss both of you. Take care, be well, and keep smiling, Maggie. Clever, intellectual, empassioned, amiable, witty... these and many other adjectives come to mind when I reflect on conversations and dinners shared with Don. I am glad I had the chance to know him as long as I did. I've always considered your and Don's marriage the epitome of True Love. To love, to work, to live together every single day and always be stimulated, always want more, and to always grow closer - it's rarer than rare and I'm not sure the rest of us realize it's even possible unless it's observed first-hand. It's what the authors and poets yearned for and what we all hope for ourselves and our children. I'm so sorry Don's passing left you bereft. But I'm also so very thankful that the two of you found each other. Thank you both for the love of fanzines you both helped to cultivate in me. A lifelong fan of comics one of my best memories period was when you and Mr. Thompson came to school for a 'parents career day' and spoke about the Comic Buyers Guide and comics in general. It gave validity to me drawing for drawing the stuff I was drawing vs. a lot of people who felt I should use my talent only drawing wildlife or some form of 'real' art. Thank you both. A beautiful tribute to Don whom I never met unfortunately, but I had read the book, All in Colour for a Dime and it certainly inspired my love of comics. A lovely tribute! I have a very fond memory of Don. At the (must have been...) 1884 Comic Con, Don walked up to me to get a photograph, I think, and KNEW ME BY NAME! I'd only been lettering professionally for all of 5 or 6 months, but Don Thompson knew who I was! I think that, even more than getting paid by for-real comics companies, made me feel like a real professional, and certainly made me grin for the rest of the con. And I'm still grinning, just thinking about it. LOVE this, thanks! 1984 I bet ... Great to see this in any case! He knew a "real professional" when he met one.